I’m marooned, but only one of them is actually for a present. So…yes, I should focus on that one. This is the first sleeve, which went very satisfyingly quick – I knit it up to the cap at Aleta’s on Saturday. My question is this – what kind of set in sleeve is only 9 cm deep? A lot of people have made this, and not commented on this issue, so I guess it works out. More of a modified drop than a set-in sleeve, I suppose. Finally back to working on this one – I’d really love to wear it for various holiday functions. 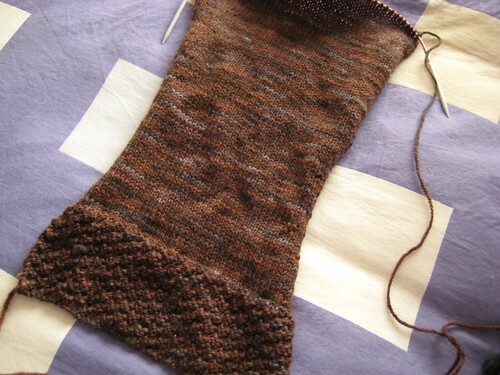 Still need to knit the rest of this sleeve, the yoke, and buttonbands…hmmm. Again with the handspun Romney. 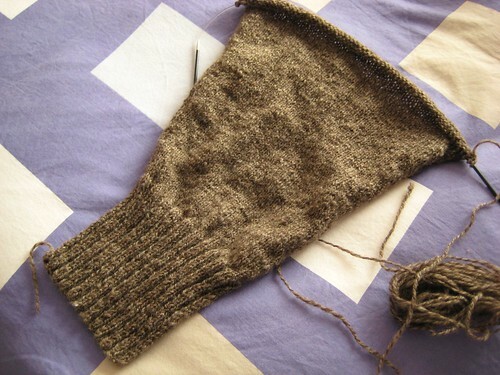 This is the first sleeve, which also went pretty fast, so I’m up to the cap. 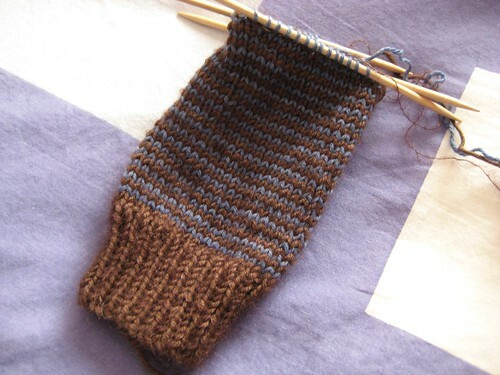 Again, kind of a wonky pattern (all will be revealed once it’s finished) – the sleeve increases up to 86 stitches, which is too wide in my opinion. So I stopped at 70 sts. Obviously, another sleeve cap to re-write. Yay. On an unrelated note, I just saw the Golden Compass on Sunday, and now I really want to make Lyra’s pixie hat and the multicoloured Gyptian coat! Of course, I’d have to also acquire quite a bit of impish charm to wear them – that might be harder to come by. P.S. 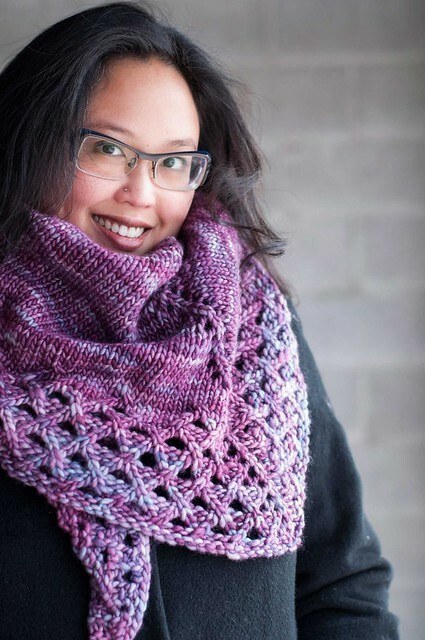 Yep, the Cashlana label was wrong – it’s 90% merino, 10% cashmere. Sad. But, still just as soft. 9 cm, huh? It’s obviously not set very far in. That’s a shame about the Cashlana. More Lanacash, really. Ooh, Fleece Artist is going to get some nasty phone calls from people, I bet. It’s still nice stuff, though. Haven’t seen the film yet, but I’m betting you could do the impish charm. I finished up my second sleeve yesterday for the A-line jacket and had the same thought. Preliminary put-together suggests more of a shaped drop-sleeve. I can’t wait to wear mine- I love the color of yours. I made up the Drops jacket in early fall. The sleeves come out nicely, no bunching around the armpits as would a drop sleeve sweater might. A rather tailored look. SO trust the pattern. Can’t wait to see it.